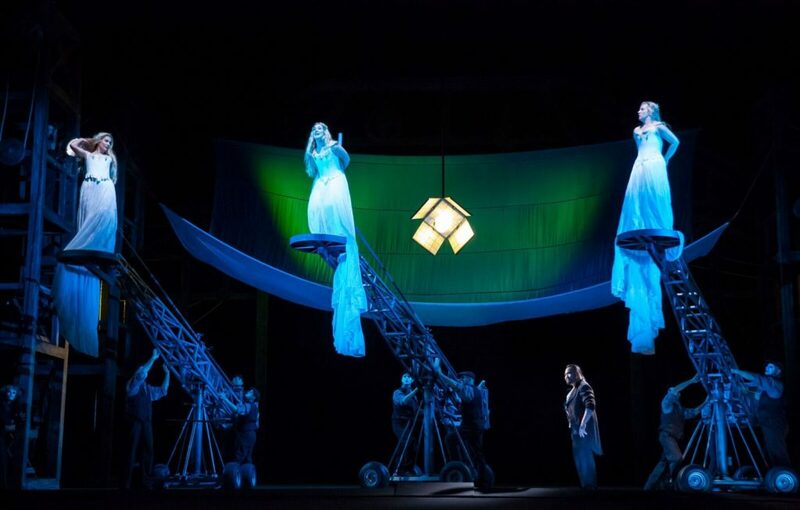 Review “Das Rheingold” (Lyric Opera): Shiny, Solid Gold Treasure! The Lyric Opera of Chicago presents DAS RHEINGOLD. The Lyric simultaneously launches its 2016-2017 season and their new production of The Ring Cycle. DAS RHEINGOLD is the first of the four Wagner operas to be presented at the Lyric. Director David Pountney introduces a solid gold Ring. Wagner’s imaginative adventure of gods, dwarves and giants explodes on stage with Pountney’s design team, Johan Engels and Robert Innes Hopkins (scenic); Marie-Jeanne Lecca (costumes); Fabrice Kebour (lighting). The opera starts on The Rhine where the maidens, Diana Newman, Annie Rosen, Lindsay Ammann, are guarding the gold. A wooden structure frames the stage. Stagehands are dressed in dark 19th Century costumes. They manipulate long rigging devices holding the maidens. The ladies are perched in flowing white gowns above a rippling blue silk river. The-play-within-the-play visual is magical. The stagehands blend into the background as the flirtatious nymphs glide along the river. The ladies bewitch Samuel Youn (Alberich) and the entire audience with their magnificent singing on their moving perches. The look is intoxicating as the ladies seductively dip and preen along The Rhine. Their enchantment is over too quickly as Youn steals the gold. Pountney keeps the pace tight. Wagner’s robust story rolls out in dynamic ways. The wooden scaffolding-like frame is consistent. Pountney moves scenic elements in and out to change location. In the next scene, two of the wooden scaffolds pivot around to reveal massive skulls mounted on top and large arms dangling. 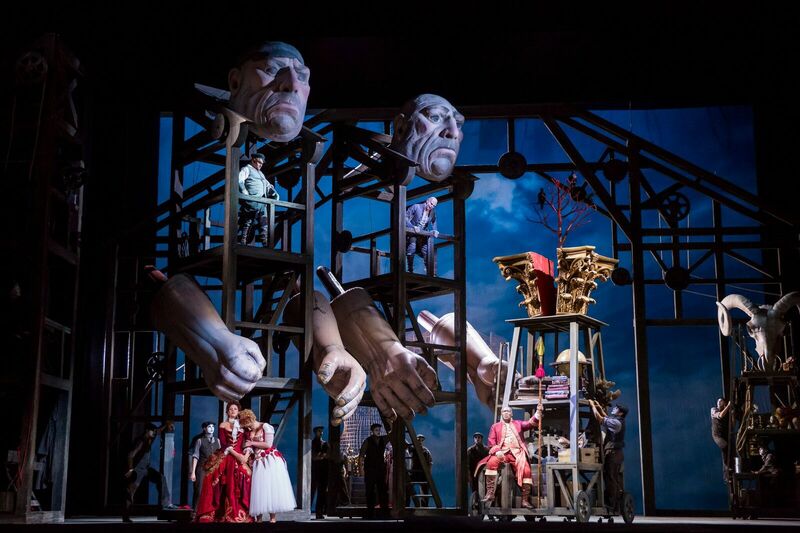 The over-sized puppets are manipulated by stagehands. Wilhelm Schwinghammer (Fasolt) and Tobias Kehrer (Fafner) play the giants. They stand on the landing below their respective skull. It’s incredibly imaginative. A monstrous hand even reaches out to capture and imprison Laura Wilde (Freia). The giants have built a grand palace at Wotan’s request (played by a commanding Eric Owens). Wotan had promised Freia as the payment for the job. The giants will relinquish Wilde in exchange for the ring. Owens and the animated Stefan Margita (Loge) head to Nibelheim to steal the ring from Youn. Kebour lights up the scaffolding in fiery colors to turn the stage into a mine. The workers’ hammers echo Sir Andrew Davis’ spirited baton as we are transported to the subterranean kingdom. Margita goads Youn to show off his helmet’s transformational powers. Pountney cleverly has inflatable props that shapeshift Youn. There are so many delightful touches like that in this operatic adventure. At one point, the majestic Okka Von Der Damerau (Erda) rises from below the stage to deliver a potent message. And even with all these magnificent sensory treats competing for best moment, the ending gets the award. It’s breathtakingly stunning as the gods go to Valhalla. I’ve often heard people shout out ‘bravo’ or ‘brava’ at the Lyric. I’ve never heard squealing and hooting at the end of an opera. It was accompanied by thunderous applause and a standing ovation. 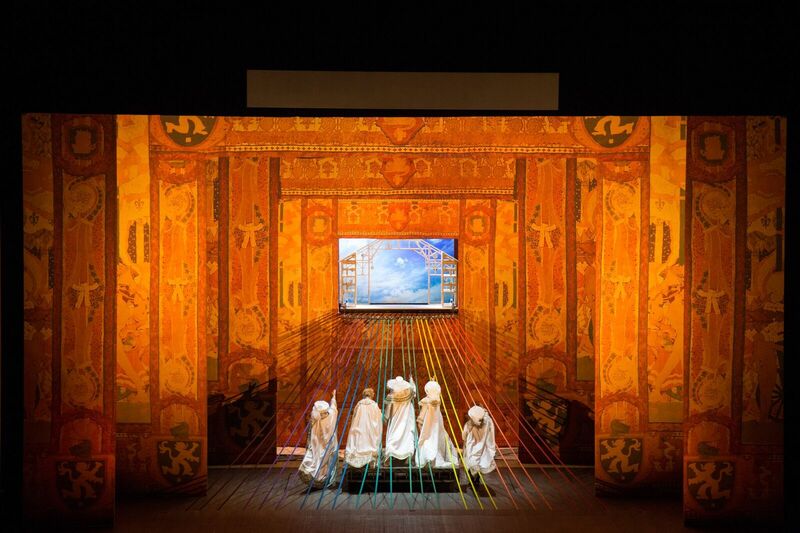 DAS RHEINGOLD is not to be missed!